Rising real estate prices are almost always expected during the spring in the U.S. More people are looking for a home and sellers that have waited until now to list their homes can usually score a quick sale if they price their house correctly. Outside of the U.S., prices are mostly on the upswing, continuing a climb that started after the fallout of the 2008 U.S. housing crisis had been realized. 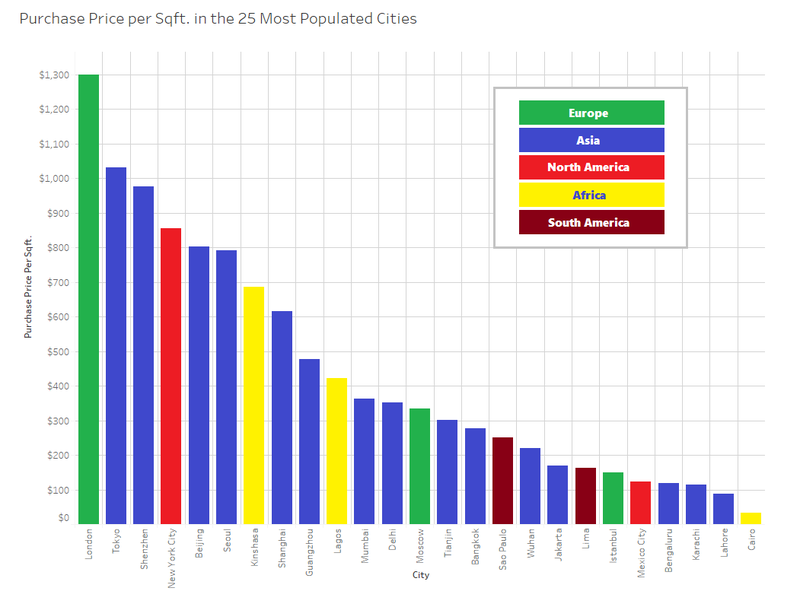 Of the 25 most populous cities in the world, only Sao Paulo saw a decrease in average purchase price per sqft. London, which was the most expensive city by sqft. last year as well, jumped to just over $1,300/sqft. On the flip side, housing prices in Cairo would be a steal compared to even rural areas in the U.S., coming in at about $33/sqft. Asian cities hold 6 of the top 10 spots with 3 Chinese cities among the highest of the top 25. It’s interesting to look at the rise of Shenzhen both in terms of population and in housing prices. 40 years ago every other city on the list, and thousands of others around the world, were bigger than Shenzhen. Today, the city holds around 18 million people in its metro region. This enormous influx of residents has driven housing prices up considerably, especially in modern high rise residential structures. Tokyo, which used to easily lead the world in average real estate prices per square foot, has been relegated to second place among mega-cities for several years. At one point in the late 80’s, real estate was so expensive in Tokyo that the Japanese Imperial Palace Complex was considered to be worth more than all of the land in California. The 1990’s brought those valuations crashing back down to Earth, but the city has remained near the top of cost-of-living lists for decades. New York City itself has always been an expensive place to live, owing to its collection of high-paying jobs, but they need to be high-paying to be able to attract employees willing to live nearby, with housing prices close to $840/sqft. (Chicken/egg situation). Prices in NYC have been on the rise for some time, with the city itself weathering the housing crisis more or less completely unscathed. In some real estate circles, the city, along with a few other downtown metro areas in the U.S. are known not to follow conventional real estate rules. Overall, prices have risen about 4% since last year. While we are still a bit off of our 2007 high, at the current pace, that should be eclipsed either late this year, or more likely, spring of 2018. In the U.S., mortgage applications are up thanks to a recent bump in credit scores (you can see yours for free if you’re curious), the season, and rising consumer confidence. U.S. prices still have a little ways to go before reaching the pre-mortgage crisis peak, but it does appear the country is well on its way there.